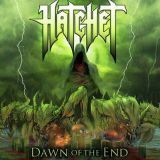 The second full-length from Bay Area thrash unit Hatchet goes a little way towards improving on the debut, starting to provide a hint of uniqueness to a band sorely in need of it. Mainly this comes in the form of a solid technicality, a precision in riff and beat that makes Dawn of the End enjoyable and sometimes exciting, two things that every great thrash album has in spades. This is not a great thrash album, however, though it is a quite good one, and does shown Hatchet off as a band to keep an eye and an ear on. Following crunchy, riff-filled intro (always a good sign) After the Dark, Silenced by Death flows seamlessly in, Julz Ramos’s sneery vocals and able guitar leading an old-school gallop that turns on a dime and uses the band’s instrumental skills well without allowing them to define the music. A couple of excellent solos later, and Dawn of the End is leaving a very good impression indeed. Where the album stumbles is in repeating this trick without offering much less new. Sure, the intro to Screams of the Night has nice bass trills and an enjoyably Slayer-esque build-up, and the soloing is again excellent, but the better part of the track is good but fairly standard thrashing. And as decent as it is, you expect a little more from a thrash band in 2013. This is a pattern that repeats throughout the album, the band coming up with good intro segments to songs but struggling to provide anything outstanding with the songs themselves. Revelations of Good and Evil is an acoustic interlude that you’ll expect to open up into some sort of early dirge a la Metallica, leading instead into the good not great Signals of Infection. It’s a missed opportunity, the band showing off without tying it into the album properly. There are exceptions, of course. Fall from Grace’s gang-shouted chorus is a step above those used elsewhere, as is the melodic instrumental section towards the end. Sinister Thoughts ups the tempo and lets the leash slightly, allowing a speedier assault as well as a slightly more varied song approach. Welcome to the Plague is similar, showing a good template for the band to build on by really pushing the soloing to the front - more of the excellent lead guitar skills shown off so ably in the soloing would be a step forward for Hatchet on future albums. The band’s strengths really need to be played to; as it is, Dawn of the End is a perfectly serviceable thrash album that contains nothing you won’t have heard before, but played well and with great soloing. Solid yet unexciting.